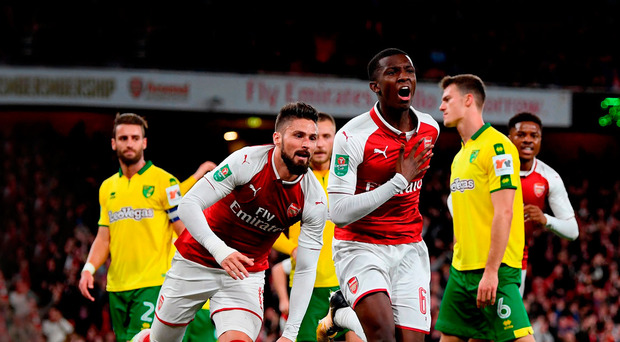 Teenage striker Eddie Nketiah came off the bench to score twice on his home debut and send Arsenal into the quarter-finals of the Carabao Cup at the expense of Norwich. Josh Murphy put Norwich ahead with a deft chip, his fourth goal in the competition this season, but the Canaries were guilty of wasting a host of chances to kill off the tie. Nketiah, 18, then equalised with his first professional goal just 15 seconds after coming off the bench. That sent the tie into extra-time, where Nketiah headed home to seal a memorable Emirates Stadium debut and put Arsene Wenger's side into tonight's quarter-final draw. Wenger made 11 changes from the team that won 5-2 at Everton on Sunday and they fell behind in the first half as they struggled to gel. Daniel Farke's Norwich took a surprise lead with Murphy latching onto a superb through ball from Sunday's East Anglian derby match-winner James Maddison before finishing past debutant Matt Macey with a cute dink. Macey did well to prevent Norwich doubling their lead before the break, pushing away a curling Nelson Oliveira shot after Murphy had wriggled free on the edge of the box. Arsenal started the second half by committing plenty of men forward and were almost caught out by a simple through ball which set Oliveira away. The Portugal international raced towards goal only to be halted by a Mohamed Elneny foul which could easily have seen the Arsenal man dismissed, with referee Andy Madley lenient in his issuing of a yellow card. The hosts toiled in their search for an equalising goal but it was Norwich who passed up a fine opportunity as Oliveira blazed over after being found by Ivo Pinto inside the Gunners' box. Murphy then wasted a half-chance before Mario Vrancic should have sealed Norwich's spot in the last eight, only to shoot wide after working space in front of the Arsenal goal. Wenger threw on Chuba Akpom and Nketiah as his side chased the game and it was the latter who was on hand to level just seconds after his introduction, turning in a corner from close range. Bryan Gunn saved superbly from Jack Wilshere in the last minute before Akpom should have won it for Arsenal deep into added time. A defensive mix-up allowed Theo Walcott a great sight of goal early in extra-time but Gunn again provided the heroics, only for Nketiah to continue his dream home debut by heading home Elneny's resulting corner. Another smart save from Gunn prevented Nketiah from completing his hat-trick as he broke free of an exhausted Norwich defence. The Norwich players surrounded referee Madley after he turned down their penalty claims as James Husband and Mathieu Debuchy came together in the box. The visitors were all but out on their feet and could not find an equaliser as Arsenal saw the game out to progress to the quarter-finals. Arsenal: Macey, Debuchy, Elneny, Holding, Nelson (Nketiah, 85 mins), Coquelin, Wilshere (Willock, 114 mins), Maitland-Niles (Akpom, 70 mins), Walcott, Iwobi (Da Silva, 105 mins), Giroud. Subs not used: OIliev, Osei-Tutu, Sheaf. Norwich: Gunn, Pinto, Zimmermann, Klose, Husband, Trybull, Reed (Jerome, 101 mins), Vrancic (Wildschut, 90 mins), Maddison (Hoolahan, 90 mins), Murphy (Stiepermann, 73 mins), Oliveira. Subs not used: Martin, Franke, McGovern.